The other night I got tired of my knitting. Maybe I didn't like the chair I was sitting in but I felt possessed to jump up, go into my office, rummage around and find some jewelry-making supplies. 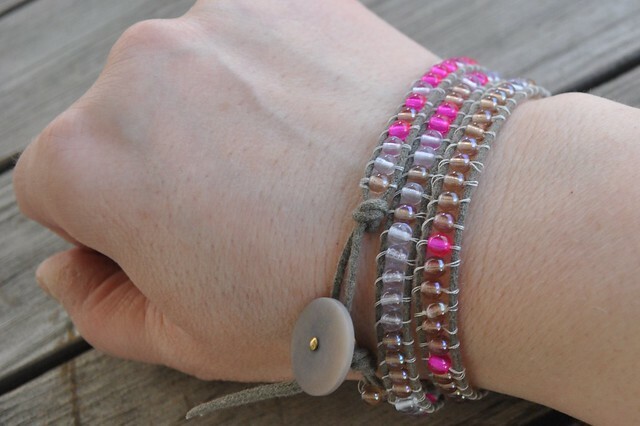 I bought beads to make this wrapped cord bracelet nearly a year ago and I finally made my bracelet. Fortunately neon is still a thing so it doesn't look too dated. Yet. I used the instructions from Fusion Beads. I mixed the colors randomly and tried to go light on the neon pink. Materials: Leather cord, .008 Fireline, 4mm Alexandrite beads, 4mm Smoky Topaz beads, 4mm Hot Pink Lumine Round Czech Pressed Glass Beads all from Fusion Beads and tagua button from The Fiber Gallery. I am deeply, deeply concerned for this model. It's like a cliffhanger TV episode. "What happened next? Did she make it down the runway and back without losing the bottom half of her outfit? Tune in next week to find out." Actually I have no idea but come back next week anyway. What the hell is that squirrel doing? Notes: This is a great pattern. 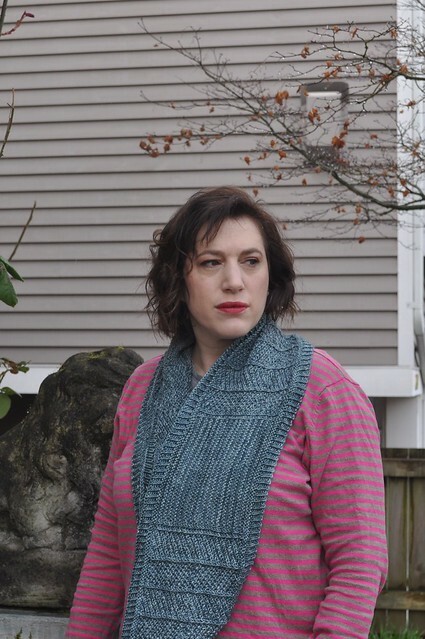 It's beautiful and easy to knit plus it lays perfectly flat straight off the needles. I didn't even block this. When Cindy said she wanted to look foxy this is not what she meant. 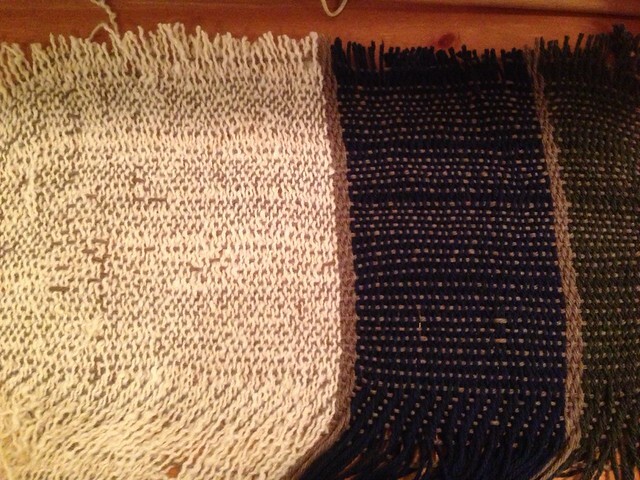 If you've been reading this blog a long time you may remember (you probably won't) that I took a weaving class in 2008. I made a few little samples in class and didn't warp the loom again until 2010. I started that sampler and never finished it. I finally cut it off the loom a week or so ago because I signed up for the Floor Loom Weaving class on Craftsy because I wanted to try weaving again. I had visions of making a big wrap from the rest of my Shetland DK but wanted to make the class sample projects first. I thought I'd use old yarn that's been in my stash the longest, this Donegal Homespun from Tahki that I got from a friend in 2003. I can't find this version on Ravelry. It's old. The price on the tag is $1.99. I used some Cascade 220 from my stash to go with it. Then I had to buy more because I somehow failed at simple addition and number sense (350 yards is more than 220). I borrowed a raddle from my co-worker, Cathy. I slowly and carefully wound my warp and warped my loom. I knew I was in trouble immediately. The Donegal was super-stretchy but also brittle and tender. After correcting threading errors, reed sleying errors and any other error a new weaver could make I could still not get the tension right. If I pulled hard enough to take the slack out of the warp the Donegal would snap. I also made a rookie error when winding on the warp of not using paper wide enough to separate the warp threads. The edges of my warp ended up shorter than the center of the warp and there was no amount of adjusting in the world to set it all right. I tried using weights off the back to tighten the slack areas but that lead to more snapping of threads. I despaired and gave up. This sad little sample is all I have to show for my few weeks of effort. And this is what happened to the rest of the Donegal. It's in the yard waste bin. Possibly related to the world's least appetizing tea cozy. Notes: I still love making these scrap hats. 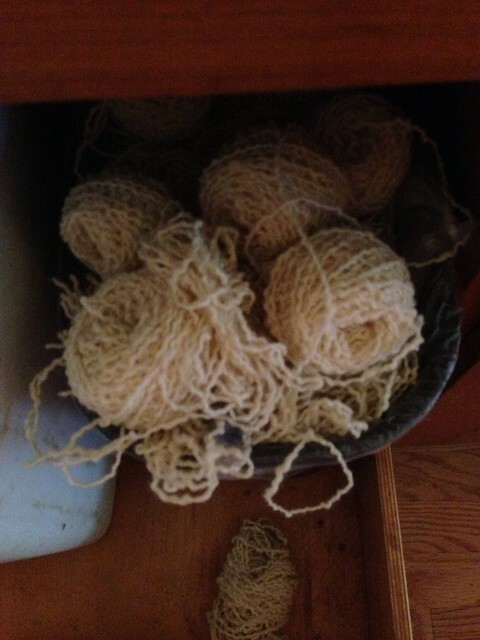 I try to gather my scraps now roughly by weight. 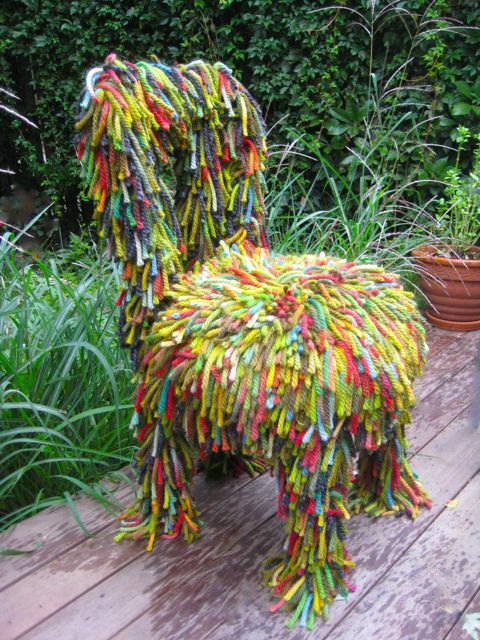 Then I can just grab a bag of scraps and use them all together to make one of these. This one has been kicking around for a while. I started it back in January to take to a meeting and then kept it in the trunk of my car for emergency knitting. I could knit these forever. 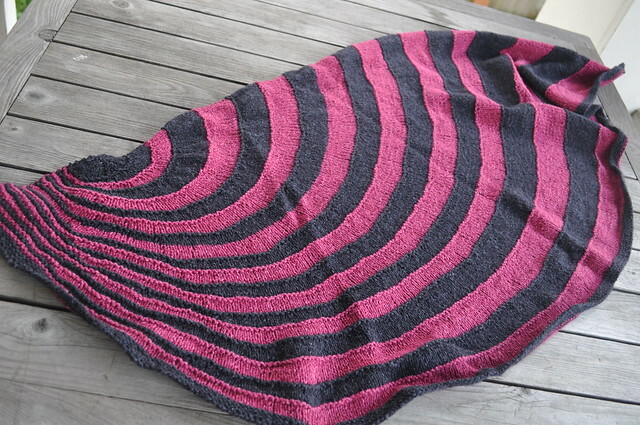 Notes: I really didn't know what to do when I finished my Sideways Ripples Shawl. 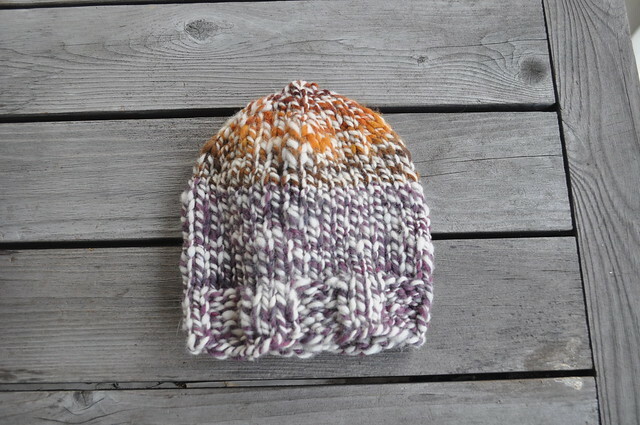 When in doubt, knit a hat. 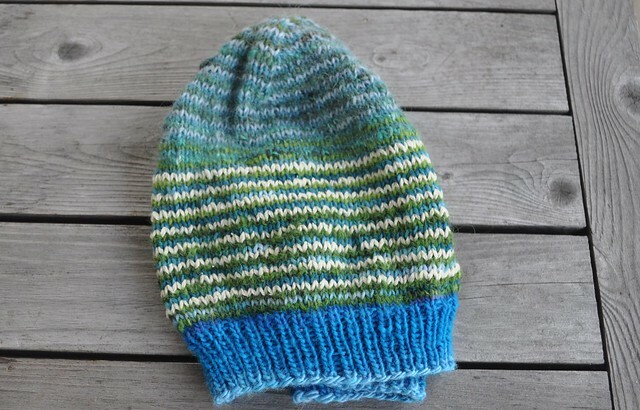 The original pattern uses one needle throughout. I hat the look of the puffy ribbing that doesn't actually draw in. I used a size smaller. This took no time to knit. Maybe the length of a single TV show. Very refreshing. Plus I love actually using my handspun. 1. No Repeat Day 24. Selbu Modern headin' to Costco. #norepeatacc, 2. No repeat Day 25. 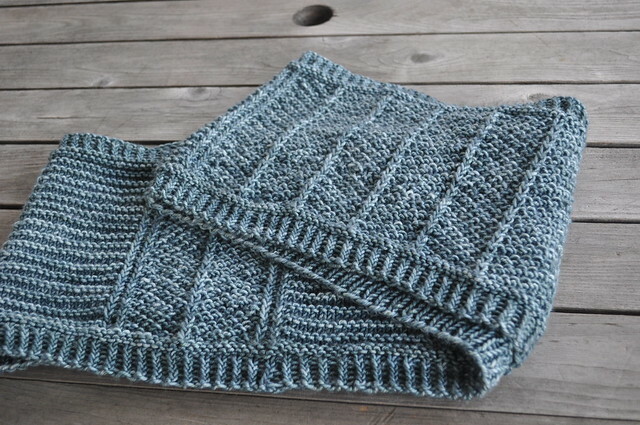 Hydrangea Neckwarmer and Nalu Mitts, both in handspun. #norepeatacc, 3. No Repeat Day 26. 198 Yards of Heaven in Eco Duo. #norepeatacc, 4. No Repeat Day 27. Ulmus by Kirsten Kapur. Looking downward because the sun was making my eyes sting and water. I am truly a Seattleite now., 5. No Repeat Day 28. 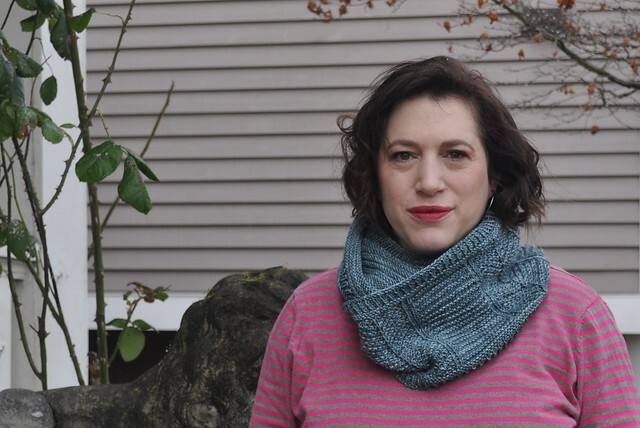 Basic Moebius cowl in Malabrigo Twist. Looking pretttty sleepy. Sorry for the sleepy, vaguely pissed off expression. It was the best shot of me wearing the shawl...if you can imagine. Notes: Be warned there is errata for this pattern! 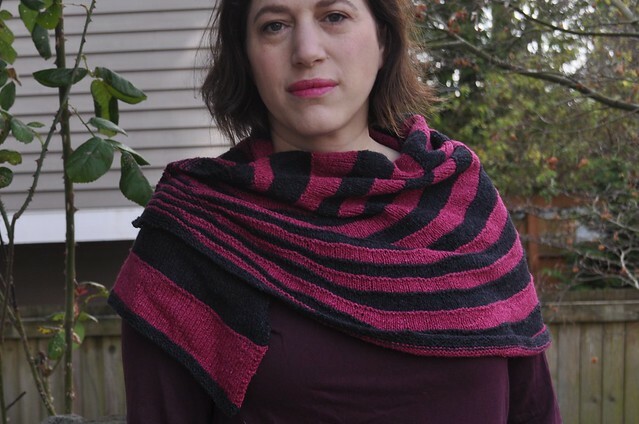 This is yet another iteration of the "putting a bunch of short row stripes in a shawl" shawl. They are popular for a good reason. They are damn fun to knit. Another thing I found I enjoyed about this project is that you cast on the long edge of the shawl--over 300 stitches--but then you start decreasing and your rows just get shorter and shorter. It's nice to tackle those really long rows when you have a lot of energy and enthusiasm for a new project instead of the slow but steady increase into longer and longer rows most shawls present. I guess the sweaters here are fifty percent off.